Bachelor’s degree (1998); Forest Products Technology, Winaya Mukti University, Bandung-Indonesia. Magister (2008); Forest Sciences, Bogor Agricultural University, Bogor-Indonesia. 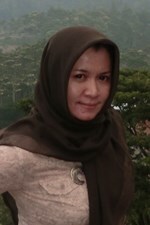 Doctor (2013); Forest Management, Bogor Agricultural University, Bogor-Indonesia. Forest policy, forest institutional, private forest management, community forest management, certification system, standardization system. Mulyaningrum., Kartodihardjo, H., Jaya, INS., Nugroho, B. 2013. Stakeholder analysis of policy-making process: The case of timber legality policy on private forest. Journal of Tropical Forest Management 19(2): 156-162. Dwipara H., Mulyaningrum., Suwarno, E. 2013. Learning organization and policy implementation of community forest. Forestry Socio and Economic Research Journal 10(2): 85-98. 2014. Konsensus Panitia Teknis PT 65-02 Hasil Hutan Bukan Kayu . As standardization expert for National Standardization Agency of Indonesia. 2013.Socio-economic study of Acacia nilotica in Baluran National Park. Removing Barriers to Invasive Species Management in Production and Protection Forests in South East Asia. As socio-economic expert for Ministry of Forestry. 2011-2012. Kajian Organisasi dan Mekanisme Perumusan Kebijakan di Pusat . As forest policy expert for Ministry of Forestry . 2011. Analisis Pembangunan Kesatuan Pengelolaan Hutan Konservasi (KPHK). As forest policy expert for Ministry of Forestry . 2011. Kajian Pemetaan dan Penataan Kebijakan Pembinaan Usaha Kehutanan menuju Perbaikan Tata Pengurusan Hutan. As forest policy expert for Ministry of Forestry . 2010. B/C ratio analysis of Timber Legality Assurance System (TLAS). As forest policy expert for Multistakeholder Forestry Programme-II, UK-aid from Departement for International Development (DFID). 2010. Action research of Timber Legality Assurance System (TLAS). As forest policy expert for Multistakeholder Forestry Programme-II, UK-aid from Departement for International Development (DFID). 2010. Pembuatan Konsep Awal Naskah Akademik Rancangan Peraturan Pemerintah tentang Tata Cara Penetapan Daya Dukung dan Daya Tampung Lingkungan Hidup . As assistant forest policy expert for Ministry of Environment.